Enfocus provides modular and affordable tools safeguarding job quality and enabling automation throughout the complete production chain. Innovative solutions improve communication between design and production while enhancing productivity and predictability through automation of routine tasks. Step-by-step deployment dramatically increases added value without forcing users to completely rethink their way of doing business. Well-known brands include Instant PDF, PitStop and Switch. Your solution for automatically creating and receiving press-ready PDFs is here! Connect 12 is designed to bridge the gap between creative and production professionals by helping designers deliver high-quality jobs right — the first time — with no IT or prepress skills required. 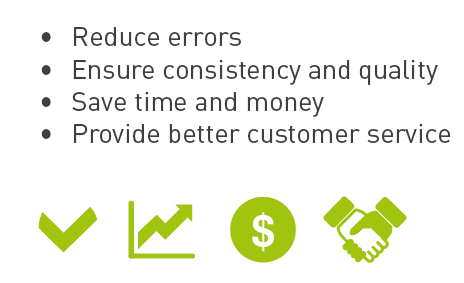 Connect 12 saves valuable time in production and helps your business to avoid costly mistakes. Today, designers are creating files for a variety of mediums – computers, mobile devices, tablets and even for multiple browsers. What happens far too often is that the files that are sent to a media service provider don't match the required output settings. The service provider then needs to correct the designers' creations so that they will be suitable for their ultimate purpose. The Enfocus Connect family was designed to increase the efficiency of PDF file delivery from designer to service provider. For PDF creation, Enfocus Connect has the Adobe Normalizer built right in — the same engine used by the Adobe Creative Suite or Acrobat. Enfocus Connect ALL provides everyone involved in the production process access to unlimited Connectors. Connect ALL ensures that received files comply with all your requirements, including verification, correction, color management, image quality and font embedding. Define two delivery points using FTP, HTTP, Dropbox or Enfocus Switch and customize where files, job tickets, or preflight reports get delivered. All files delivered can be transferred directly into a production workflow. Enfocus Connect SEND provides users with a way to deliver files to any service provider without having to use a complex FTP site HTTP uploader and avoids the normal email and telephone support required to ensure settings and delivery credentials are correct. Connect SEND ensures that you can handle your customers’ jobs without the normal endless back and forth trying to determine which job goes to which customer and what exactly they have ordered. 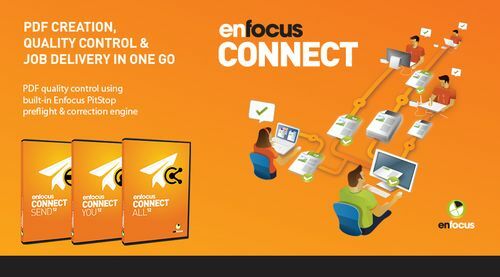 Enfocus Connect YOU gives graphic arts professionals the ability to create customized Connectors on their desktop. For PDF correction and verification, Connect uses Enfocus PitStop technology, which provides superior quality control for all PDFs processed by Connect. When you print or drag-and-drop your work to the Connector, it generates a certified PDF, giving you the confidence of knowing that the integrity of your design will be maintained. What's new in Connect 12? Connect 12 addresses the most common problems with PDF files at the source – on the creator’s workstation, where they can be easily fixed. By controlling the overall PDF creation process, and tying it to the correction and preflight capabilities of the built-in PitStop technology, typical issues such as missing fonts, low-resolution images and other common problems are easily addressed before the PDF files are received by the service provider for production. Eliminate your PDF compliance woes – start saving time and money, and avoid project "derailment" today!